Everyone's seen the pictures of Obama riding a bike. Turns out that his Secretary of State can ride a bike, too. 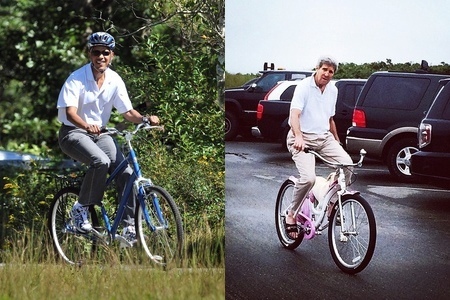 So, in a bicycle race between Barack Obama and John Kerry, who would win? Depends on who is the doper and who is the dopee. You might notice that neither is wearing a yellow jersey. neither, they would both be mocked by Nelson Muntz and go home crying. no training wheels on either. Whoever smoked the most choom before the race. But they both get blue ribbons for participating. The Late Night Show comedians? 9-Chip-only the ones willing to be subjected a long, painful IRS audit. The country wins whenever both of them are on their bicycles, because they aren't actively messing things up. The winner is the one with the most Hello Kitty decals on his bike. Speaking of bicycles, did you know John Kerry was in Vietnam? The front gears and chains on both bikes win, because they snags their pant legs and devour both of them before their secret service details can do anything about it (and also because I'm betting neither is smart enough to stop peddling when this happens - kind of like how they govern!). Also: riding a bike in slacks in not exercise - it's a photo op.